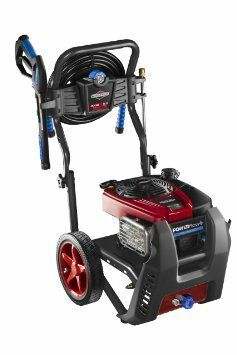 The Briggs and Stratton 3000PSI petrol pressure washer is a high quality commercial grade product that is both reliable and durable. Suitable for fences, garage floors, cars, oil stains, second story buildings, cladding, paint prep and more. Powered by a Briggs and Stratton 875 Series OHV 190cc engine, built and used for its high performance and reliability. Accompanied by the detergent injection system which significantly increases the cleaning power of the machine. Equipped with a 5-in-1 nozzle for varied pressure rates to suit multiple cleaning tasks proving that this Briggs and Stratton pressure washer is a well rounded commercial machine. The heavy duty axial pump with a brass head ensures that your buying a product that is strong and durable to withstand day in, day out use.